Three of the Lay’s Do Us a Flavour potato chip varieties. Missing is Perogy Platter, which I found after taking the photo. When I started hunting for the four different Do Us a Flavour potato chip varieties from Lay’s a couple weeks ago, they were very hard to find, at least around Calgary. It was as though there’d been a run on them at grocery and convenience stores, where shrewd marketing and consumer curiosity conspired to keep them in short supply. Maple Moose was easiest to find, followed by the Caesar flavour. When I snapped the above photo last week, I still didn’t have a bag of Perogy Platter in my hands. So if you’re having trouble finding them, you’re not alone. The whole promotion is kind of interesting, and it’s been getting buzz in online circles. In case you’ve haven’t heard of it, here’s the back story. Lay’s launched a public search for new flavours, the chip-loving public responded with a whole lot of suggestions, they whittled down the selection to four finalists, they developed the flavours and made the chips, and now they’re in stores for consumers to try. 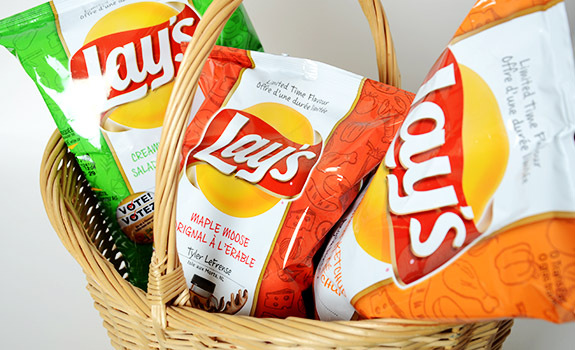 One of the four finalists will be chosen for a spot in the regular line of Lay’s chips based on online voting at lays.ca/flavour. (Voting ends on Oct. 16, 2013, so if you found this review after the fact, sorry.) The person who pitched the winning flavour to Lay’s will be compensated with $50,000, along with 1% of future sales of their flavour. See? Curious. Since I’ve now tracked down all four flavours, here are my impressions of each one, in order of least favourite to most. Maple Moose: I assumed these would be maple flavoured, with the moose reference thrown in to make it sound more Canadian. I was wrong. These have a chemically smoky, gamey, pseudo-meaty flavour to them that’s clearly supposed to be moose. Open the bag, and smoky grease hits you. The smoky taste is not mesquite smoke, but threw-a-plastic-plate-in-the-campfire smoke. Any maple in the mix gets buried by the nasty meat and smoke flavours. Maybe the flavour scientists haven’t had enough practise with moose? Avoid like the plague. Grilled Cheese and Ketchup: Slice open the top, and the smell of ketchup chips hits you. Unfortunately, it’s an odd chemical note that hits your tongue on first bite, with processed cheese slice running roughshod over ketchup. You can almost taste the margarine on the cafeteria-grade sandwich bread as it hits the frying pan. Not very pleasant, but not the worst of the flavours. As an avowed fan of both ketchup chips and grilled cheese sandwiches, I was really hoping to like these. Sadly, they’re not that great. Creamy Garlic Caesar: Tick, tick and tick. It’s got creamy onion flavour with some cheese to the creaminess, and a hefty hit of garlic. (Don’t eat these before a board meeting.) Lots of flavour, which the grilled cheese chips were lacking. They’re like a classy, modern riff on sour cream and onion chips. Not bad at all. It’s going to come down to this one and Perogy Platter. Perogy Platter: Yes. This is the one. Lots of green onion, bacon and sour cream in the mix here. Maybe it works so well because it’s a novel new combination of existing seasonings from the chip flavour canon, so it’s harder to misfire. What I think of as a signature perogy flavour – that oily, doughy taste of a nicely pan-fried specimen – is present somewhere in the middle of the stronger topping flavours. It works. I’d buy it again, which to me is the ultimate test of a new chip flavour. Cost: Depends on the size. Smaller bags (75 g), around $1.49. Larger bags (180 g), around $3 to $3.50. I’ve seen them on sale, so you may find them for less. Value for cash money: In line with other Lays chips. Availability: Availability is spotty. I’ve had better luck at convenience stores and pharmacies than at grocery stores, though it looks like everywhere is starting to get more stock. While you can check the chip aisle, they might not be there. Look for end displays, special racks in the aisles, or other placements that are supposed to draw attention to them but actually make them more difficult to find. The verdict: If I could pick one winner, it’s Perogy Platter, hands down. It’s the one with the most potential for a prolonged stay on store shelves, and the flavour is both novel and familiar. Also interesting to me is the regional split that might develop here. In Western Canada, perogies are nearly a religion, and people regularly argue over the spelling of perogy, the best filling, how to cook them and how to serve them. Not sure if this will play a factor, but as noted above, I must have visited 15 stores before I finally found a bag of Perogy Platter in Calgary, which speaks to its popularity.